The following are links about City Hospital you may find interesting. Also check out the other pages. The following are comments left about City Hospital from site visitors such as yourself. They are not spell checked or reviewed for accuracy. Just as the Memorial Hospital started out in the mansion of Samuel Davis, the City Hospital had its beginnings in the Bigelow Mansion. However, rather than private funding, it was created on may 23, 1871 by an act of state legislature. from a 1900 book about worcester http://www.archive.org/stream/dictionaryofworc00rice/dictionaryofworc00rice_djvu.txt Hospital, (The City)— This institution was incorporated May 25, 1871, and was opened at the Abijah Bigelow house on the corner of Front and Church streets, Oct. 25, 1871. George Jaques soon after gave three and a half acres of land on Prince street (now Jaques avenue) as a site for a hospital, and at his death left the remainder of his estate, in value nearly $200,000 as a fund for its support. The Jaques homestead, at the corner of Wellington and Chandler streets, was occupied as a hospital from January, 1874, to December 8, 1881, when the present building on Jaques avenue was ready for use. At first there were only the main building and two wards, but in 1882 another ward was added, and later the Gill and Salisbury wards were built from funds given by Mrs. Sarah W. Gill and Stephen Salisbury, Esq. Mrs. Helen C. Knowles gave at her death $25,000 for the erection and maintenance of a lying-in ward, and this has been completed, and is known as the "Knowles Maternity." There are now seventy beds at the Hospital, and over 1,000 patients are treated yearly. A training school for nurses has been established at the hospital. The institution is under the direction of a board of seven trustees. Dr. Charles A. Peabody is the superintendent. 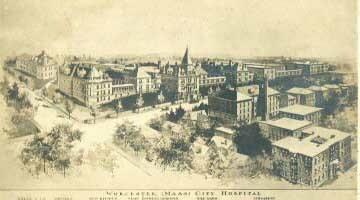 The sum of $15,000 was appropriated by the City Government for the support of the hospital for the present year (1892). Does anyone know the exact day Worcester City Hospital Closed? The best I can find is September 5, 1991. When they stopped accepting inpatients and transitioned over to Community Healthlink, etc. 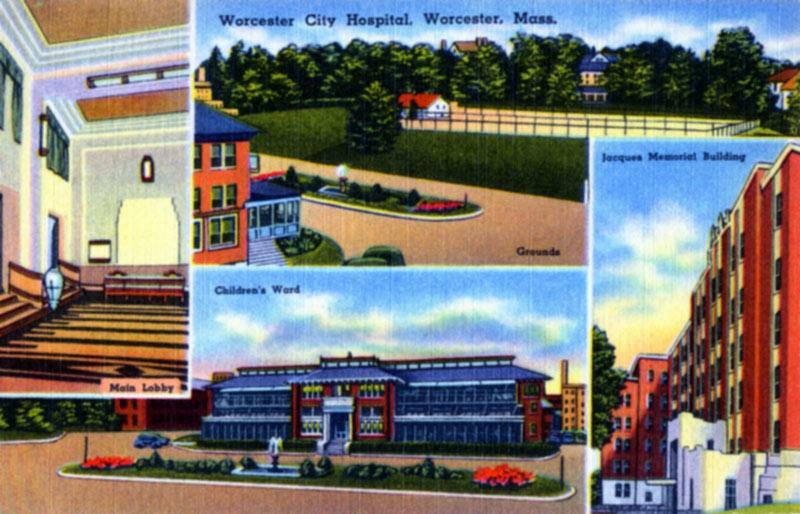 Worcester City Hospital closed it's doors on Thurday Sept.5,1991. Admissions were stopped in August and all patients had been transferred to appropriate facilities a few days prior to closing. A sad day after 120 years of serving those in need. Does anyone remember where surgical and intensive care units were located? Hi, Ami, you may be able to help me. I am looking for a nurse or aid that worked in the maternity ward at City Hospital in 1963. She had been liberated from Auschwitz. She had a tattoo, and loved the babies, because she was unable to have children due to sterilizations done at the camp. She took a liking to me and my Mom, who were there for a month after I was born. She had named me 'Moonface', and paid special attention to me. I am looking for her name, since she may have signed medical charts, etc., at her job. She would have been in her 40's probably. Any recollections anyone? Bill.....the surgical ICU & medical ICU were separated. If I remember correctly one was at the end of the corridor of JM1 and the other at the end of JM2. I am researching where my parents lived in Worcester. They were from China and lived in the City. I was born 1964 in Worcester and was wondering where I can locate those records that would indicate their address at the time. The City Clerk office is no help. Any idea who would have those records. I worked as a dishwasher/ helper in the kitchen at WCH from October 66 to March/April 67; when I took a much cleaner job at Denholm & McKay Dept store. I recall taking the food trucks up to the wards and collecting them later. Ruined several articles of clothing while washing dishes. Hi Sue, I am a former patient of Dr. Cohen. He was affiliated with City Hospital. He had me admitted there so many times as a child, I lost count. He left me to the care of other foreign doctors, checking on me occasionally. He was a well known pediatrician. He had offices at The Fallon Clinic on Plantation Street. As a child with life threatening asthma and allergies, I spent a lot of time there, in oxygen tents. i clearly remember the constant blood draws, along with the x-rays, without use of lead aprons to protect my reproductive organs. I remember the names of some drugs they used on me, as well as experimental inhalation therapies. Most of all, I remember some of the other children...Hope this is of some help--it would be helpful to find out where medical records are archived.